Anna and Daniel planned their wedding with an elegant summer garden theme to fit perfectly with the stunning marquee and surroundings of the venue. 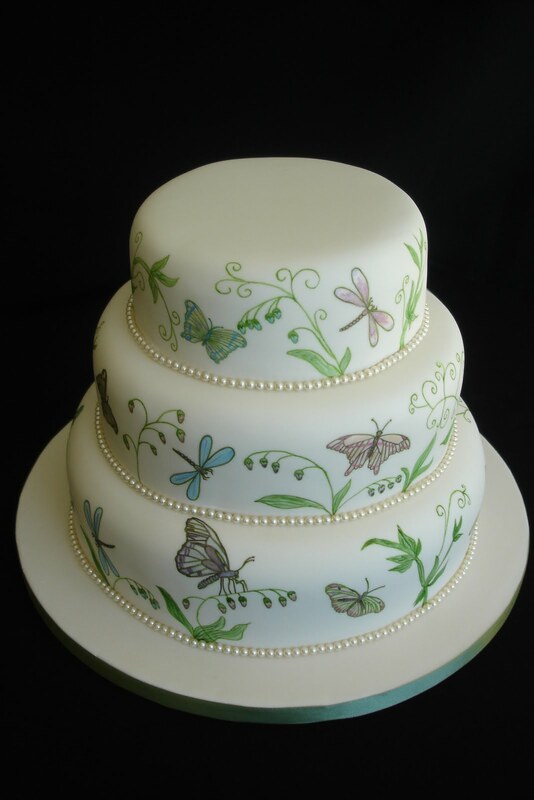 The Pobyl-Y Cwm actress selected a design featuring hand painted butterflies and Swarovski crystal pearl detailing to create this beautifully effortless cake. The bottom tier was vanilla with fresh raspberries and a white chocolate ganache, the middle tier a citrus flavoured sponge infused with orange liqueur and the top tier coconut with a lime and coconut liqueur filling. Wedding cake designer Annette Tudor has always had a passion for baking and sugarcraft. With over 15 years experience in sugarcraft and several years of teaching cake decorating she creates exquisite cakes that are innovative, inspirational and individual. Tiers and Tiaras specialise in creating bespoke wedding cakes, celebration cakes, cupcakes and edible favours to complement the design elements of any special occasion in order to make it truly memorable. Tiers and Tiaras create cakes that both look and taste exquisite and as such only use the finest ingredients. Wherever possible organic, locally sourced or fairtrade products are used so that your cake is of the highest quality and tastes truly scrumptious! Photos published on this blog are subject to copyright law and as such are not to be reproduced or copied.